"Das Maul von Krokodilen hat nicht nur furchterregende Zähne, sondern auch äußerst sensible Sinneszellen. Es sei somit noch empfindlicher als unsere Fingerspitzen, berichten amerikanische Biologen im britischen "Journal of Experimental Biology". Grundlage für dieses Feingefühl seien hunderte winziger Tasthügel. Köpfe und Mäuler von Krokodilen und Alligatoren sind von tausenden winziger, kuppelförmiger Erhebungen bedeckt, deren Funktion bisher allerdings unklar war. Kenneth Catania und Duncan Leitch von der Vanderbilt Universität in Nashville (USA) untersuchten diese Erhebungen mit einem Rasterelektronenmikroskop und entdeckten, dass sie beweglich in einem ringförmigen weichen Graben eingebettet sind. Weitere Analysen zeigten Strukturen, wie sie für Tastorgane typisch sind. Zudem befinden sich in den Hügeln zahlreiche Nervenenden.Um zu prüfen, ob die kleinen Hügel wirklich Tastorgane sind oder, wie bisher vermutet, die Bewegung oder den Salzgehalt des Wassers melden, experimentierten die Forscher mit lebenden Nilkrokodilen. Dabei stellte sich heraus, dass bereits die Berührung einer der Erhebungen mit einem kleinen Haar eine Reaktion auslöste. "Sobald die Tiere etwas fühlen, schnappen sie zu, und das innerhalb einer Zehntelsekunde", schreibt Catania. Die Forscher nehmen an, dass die Tiere ihren ausgereiften Tastsinn nutzen, um schnell zwischen im Wasser treibenden Pflanzenresten und Essbarem unterscheiden zu können. Und auch für andere Dinge benötigen diese Reptilien manchmal eine sehr sensible Schnauze: Krokodilmütter helfen oft ihren winzigen Kindern beim Schlüpfen, indem sie diese sanft aus dem Ei pellen." "They may be lethal, leathery, and literally armored to the teeth, but crocodiles and alligators, it turns out, are sensitive types. Their snouts, in fact, are even more touch-sensitive than human fingertips, a new study says. 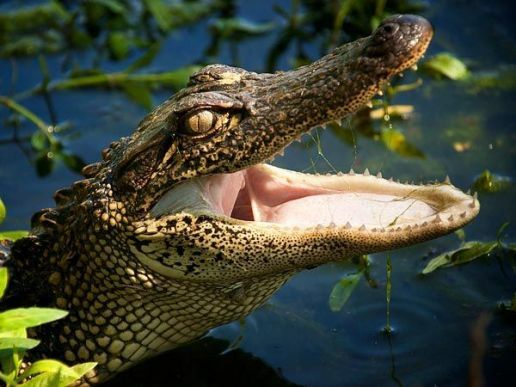 Part of the crocodilian reptile order, alligators have some 4,000 of tiny, raised black spots, or domes, on their heads, particularly along their jaws, inside their mouths, and between their teeth. Crocodiles have a similar setup, plus a liberal sprinkling over the rest of their bodies, bringing their total to about 9,000.Scientists have known about these bumps—called integumentary sensory organs, or ISOs—for more than a century. But for a long time their purpose was a mystery. Perhaps, some biologists suggested, the domes have a waterproofing purpose. Or maybe they detect faint electrical fields given off by prey—or salt, to alert crocs to unsafe drinking water.In 2002 an alligator study seemed to crack the mystery. Croc dots, it revealed, could detect ripples from even a single drop of water-and therefore even very weak prey movements. Until now, though, a couple of big questions continued to intrigue scientists: How did the domes work—and just how sensitive are they? Vanderbilt University student Duncan Leitch took it upon himself to solve the mysteries. The results of his croc research appear today in a Journal of Experimental Biology report coauthored with his advisor, biologist Ken Catania. 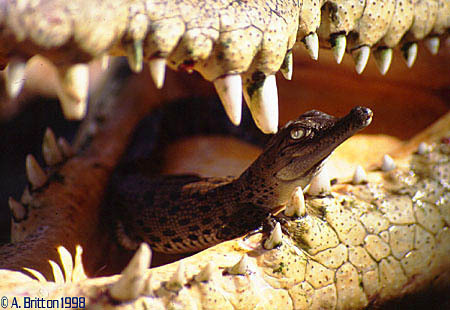 After taking a croc-handling course (pro tip: poke an unruly croc on the nose—especially sensitive due to those dots), Leitch ordered relatively small alligators from refuges and crocodiles from commercial breeders.Examining domes on 18 American alligators and 4 Nile crocodiles, he found that the spots contained touch receptors tuned specifically to pressure and vibration, plus a host of raw nerve endings.The domes didn't respond to salt or electricity, but they did respond to the touch of von Frey filaments—hairlike, standardized wires used to gauge sensation levels. In fact, some of the domes turned out to be so sensitive they could detect pressures too small to measure via the filaments. "My professor and I didn't believe at first that they could be that reactive," Leitch said. "We closed our eyes and tried to tickle each other with [the filaments] on our fingertips, and neither of us could even feel it." 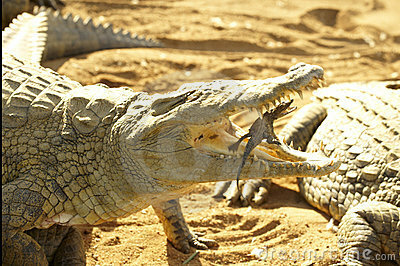 Later, using croc carcasses, the researchers stained the dome nerves with dye and traced them back to the brain. They turned out to be tied into a system stemming from the trigeminal nerve—associated with biting, chewing, and swallowing. Go figure. 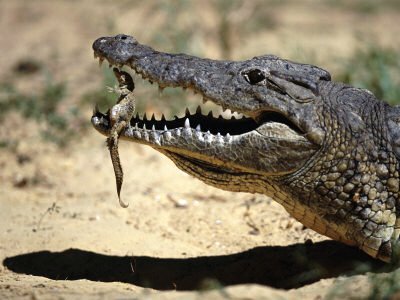 The new croc-sensitivity study "is really valuable," said Kent Vliet, co-chair of the Association of Zoos & Aquariums' Crocodilian Advisory Group. "This was exactly what I had hoped somebody would do with ISOs, in terms of really looking at the distribution and the electrophysiology, because that's really the way to answer these questions about function in a tiny sense organ like this." Future studies, Leitch hopes, will map out how the bumps' sensations are represented in the reptiles' brains—and perhaps uncover why crocodiles have bumps on their whole bodies, whereas on alligators, only the snouts have domes.And, given his apparently undiminished enthusiasm, he may be just the guy to find out. "What's interesting to me is that such a scaly animal, one that's so heavily armored, could have a sensitivity that rivals or surpasses our tactile abilities," Leitch said. "But they have all these little tactile areas that are so exquisitely sensitive—it seems really amazing." Krokodile sind interessante Tiere. Auch ihre Brutpflege ist beeindruckend. Sie sind mit Sicherheit intelligenter, als es ihnen gemeinhin zugetraut wird. Krokodile mag ich nun überhaupt nicht. Bei ihren Riesenmäulern mit der Lizenz zum Töten bewundere ich nur den vorsichtigen Transport ihrer schlüpfenden Brut zum Wasser. Die putzigen Quiecklaute der Kleinen ist das einzige, was mir an dieser Spezies gefällt.